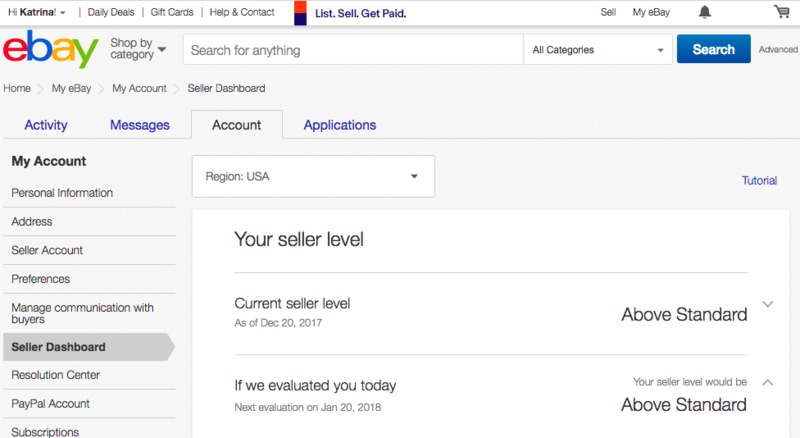 Selling on Ebay is a great side hustle. I listed a pair of Lu’s outgrown shoes for $12 or best offer. I got $10 for them. Subtracting the Ebay and Paypal fees, that’s $7.26 in my pocket for a few minutes snapping pictures after Lu went to bed. Say it took me 20 minutes total to stage the item, take pictures, store, and ship once sold. That’s three listings an hour. If I sold three pairs of shoes for that same price, that’s $21.78 per hour. If I sold higher value items, it can be even more lucrative. You don’t necessarily have to sell what’s trending on Ebay to make money. A dedicated photoshoot area is ideal. But really, find slightly OK lighting and a clean background. Snap a pic. It’s that easy. I’ve taken grainy pictures using my sofa or comforter as backdrop. I’ve laid dresses on the clean floor and stood on the coffee table to take a photo of the whole length. You don’t need to be Annie Leibovitz or Helmut Newton. As you start typing in the item description in the app, Ebay will auto-suggest categories and similar listings to help you price the item. If what you have to part with is average stuff, you won’t get rich selling on Ebay, but it’s a nice way to turn “trash” into “treasure.” Do you have trouble finding money to put in a college fund or stick in an IRA? Consider what you can sell. Then put every single penny of the sale proceeds into savings. I’ve sold new and used items through various methods. I like Ebay for the convenience and higher price you can command. I’ve consigned clothes in the past at local shops like Buffalo Exchange. When we moved, I sent a box to Swap.com. While they sold my items for between $7 to $20, I’d only see $2 to $10 of it after their cut. But, beyond shipping off my items at one time in one big box, my work was nil. I just got a check recently for another Swap.com item that sold a year after I sent them items. Not bad for a side hustle. Ebay > consignment > online consignment > yard sale. Craigslist can be good for certain things. In some places, Facebook’s marketplace likely good. I’ve had success selling big items on Craigslist, like our charcoal grill and portable washing machine. I’ve never tried or bought from Facebook’s marketplace. Ebay of course suggests the most in-demand items for you to sell. But, really, anything goes. When Lu was a babe, I sold her outgrown and unneeded items. I sold her newborn size cloth diapers and used the money to buy the bigger size she needed as she grew. I did not make earth shatteringly huge money, but I also did not try that hard. I listed and sold items when it was convenient and easy for me. I put nearly all the money I made into Lu’s savings. That’s part of the reason she’s so rich. Setting aside a few dollars here or there adds up. Like learning anything new, it’ll take a little longer at first as you spend time finding a place to stash items that have been listed, sort out where in your house to take pictures, etc. I found buying a small postage scale and poly bags to slip small clothing items into to be a great initial investment. I used Ebay’s built in shipping tools to purchase USPS postage and print labels to tape onto my packages. Etsy charges you fees up front when you list an item. If it never sells, you’re still out the cost for trying to sell it. Ebay also has “listing fees” but they often run promotions giving away so many free listings to a seller each month. I’ve never paid to list an item. I’ve only paid the “final value fee” upon the sale and the small fee to Paypal for processing the payment transaction. One important thing to keep in mind is that you’re not your buyer. Don’t think just because you think something is hideous or not worth money that someone else feels the same way. Check out “sold” listings on some items to confirm if it’s worth selling or should go straight to the donate or trash bin. For instance, I pointed out to my friend who collects bones she finds in the woods that others would pay good money for them. There are people who make a living at buying and selling on Ebay. Scavenger Life is all about how to turn “trash into cash.” If you’re looking to find a way to make some extra money to set aside, check out Scavenger Life, read up a little bit more, and start listing! Net Worth Update December 2017: $80,471<< >>I'm buying a house!